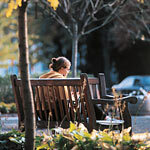 The School of Environmental and Biological Sciences offers bachelor's degree programs in 25 programs of study (curricula), many with several areas of further concentration (options). All programs of study are designed to achieve the goals outlined�in the section on Missions, Goals, and Core Curriculum Requirements of the Undergraduate Program. In the following descriptions of the first seven of these area requirements, the numbers of credits indicated�are the minimum requirements established by the school's faculty for all bachelor's degree programs. Many programs require specific courses that must be used to fulfill some of these areas and in some cases these program-specific requirements may exceed the school's minimum requirements. No course may be used to fulfill simultaneously more than one of the general school core requirements (Areas I-VII); however, a given course may fulfill simultaneously both a general school core requirement in Areas I-VII and a major program requirement (Area VIII--proficiency in a field). Before selecting courses, students should consult the requirements for each program that they are considering, and discuss these with�their academic adviser. Lists of courses that fulfill the various requirements can be found in the Degree Navigator system (http://nbdn.rutgers.edu).